Mr. Lincoln and Sons: The "Sons"
Burlingame, Michael, Journal of the Abraham Lincoln Association, "Nicolay and Hay: Court Historians,". Schaff, Jon, White House Studies, "The Domestic Lincoln: White House Lobbying of the Civil War Congresses,". Burlingame, Michael, (Johns Hopkins University Press, 1998) Lincoln observed : Civil War dispatches of Noah Brooks. Staudenraus, P. J., Mr. Lincoln's Washington: The Civil War Dispatches of Noah Brooks. Hay, John, At Lincoln's Side: John Hay's Civil War Correspondence and Selected Writings. Burlingame, Michael, Lincoln's Journalist: John Hay's Anonymous Writings for the Press. Burlingame, Michael, Inside Lincoln's White House: The Complete Civil War Diary of John Hay. Dennett, Tyler, John Hay: From Poetry to Politics. Owens, Patricia, Lincoln Herald, "The Friendship of Henry Adams and John Hay,". Thayer, William, The Life and Letters of John Hay. Temple, Wayne C. and Justin R. Turner, Lincoln Herald, "Lincoln's Castine". Stoddard, William, Inside the White House in War Times: Memoirs and Reports of Lincoln's Secretary. Stoddard, William, Abraham Lincoln: The True Story of a Great Life. Stoddard, William, Inside the White House in War Times. Neill, Edward, Reminiscences of the Last Year of President Lincoln's Life. Burlingame, Michael, With Lincoln in the White House: Letters, Memoranda, and Other Writings of John G. Nicolay. Nicolay, Helen, Lincoln's Secretary: A Biography of John G. Nicolay. Dupre, Huntley, Edward Duffield Neill: Pioneer Educator. Springfield merchant John Bunn recalled how John Nicolay and John Hay came to work for Mr. Lincoln in 1860. Former Lincoln law partner Stephen T. Logan raised a fund of $5000 to handle Mr. Lincoln’s correspondence. Shortly after this John G. Nicolay, then a clerk in the office of [Secretary of State] O.M. Hatch, agreed, without compensation, to give such time as he could to attend to Mr. Lincoln’s political correspondence. Mr. Hatch was then Secretary of State, and he and the clerks in his office arranged their duties so that Mr. Nicolay might have considerable time at his disposal in connection with Mr. Lincoln’s correspondence. Although he worked hard, Nicolay also played hard. Sellers wrote: “One of the most puzzling, and perhaps damning, aspect of Nicolay’s White House service was his habit of going on extended summer vacations at the height of each campaign season. These trips put the secretary completely out of touch with authorities in Washington for days and weeks at a time. Anticipating criticism of a seeming indifference to the war, Nicolay informed fiance Therena that we was only trying to avoid the heat and inevitable fevers that plagued Washington each summer, but he later admitted that he was more likely to lose his temper than his health if he remained in the White House.”19 When Nicolay took a vacation or business trip, his responsibilities fell to John Hay. Like his colleagues, Stoddard was impressed by the complex style of leadership which his boss exercised. In July 1862, Stoddard wrote: “The President is almost a mystery. Men no longer query whether such or such a General or statesman directs his actions, but ‘what will he do with’ this statesman or that General. He is the most perfect representative of the purely American character now in public life perhaps the most perfect that ever has existed. This is why the mutual understanding between him and the people is so perfect. This it is which enables him to exercise powers which would never by any possibility be entrusted to another man, though his equal in other respects. 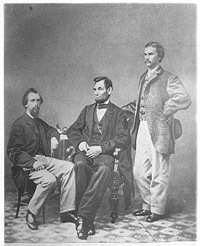 Both Nicolay and Hay were expected to enter the diplomatic service at the beginning of President Lincoln’s second term. When Nicolay was confirmed by the Senate in mid-March, the National Intelligencer reported: “He will, it is understood, not proceed to Paris immediately, but will remain at the Executive Mansion for some time.”42 Nicolay and Hay were burned out and looking forward to turning over their duties to a journalist they didn’t particularly like, Noah Brooks, an Illinoisan who wrote for the Sacramento Daily Union in California. They may have read that Brooks had written that President Lincoln’s “immediate subordinates are snobby and unpopular.”43 He added that “the least said of them the better, perhaps.”44 They probably knew that Brooks had been conspiring with Mrs. Lincoln, with whom they had a rocky relationship, to replace them. In December 1864 Philbrick wrote an Illinois official: “Mrs[.] will try to put in her favorite, Mr. Brooks, a newspaperman.”45 Mrs. Lincoln had a fellow schemer in Dr. Anson Henry, a longtime friend of the Lincolns whom had come to know Brooks, a fellow Illinoisan transplanted to the West Coast, on his trips to Washington, D.C. from Oregon. In the decades after the President’s death, Hay, Nicolay, Stoddard and Brooks all picked up the thread of Mr. Lincoln’s life and wrote memoirs and biographies. These works are among the most valuable sources of information about Abraham Lincoln’s life in the White House. Michael Burlingame, With Lincoln in the White House: Letters, Memoranda, and Other Writings of John G. Nicolay, 1860-1865, p. 30. Jesse W. Weik, The Real Lincoln: A Portrait, p. 283-284. David M. Potter, The Impending Crisis: 1848-1861,p. 555. John Russell Young, Men and Memories, p. 453. Doris Kearns Goodwin, Team of Rivals: The Political Genius of Abraham Lincoln, p. 545. Matthew Pinsker, Lincoln’s Sanctuary: Abraham Lincoln and the Soldier’s Home, p. 110. David Herbert Donald, “We Are Lincoln Men,” Abraham Lincoln and His Friends, p. 178. Charles M. Hubbard, Lincoln Reshapes the Presidency, p. 64 ( John R. Sellers, “Serving President Lincoln: The Public Career of John G. Nicolay”). Michael Burlingame, At Lincoln’s Side: John Hay’s Civil War Correspondence and Selected Writings, p .110 (Letter from John Hay to William H. Herndon, September 5, 1866). Michael Burlingame, Inside the White House in War Times, p. 157. Michael Burlingame, Lincoln Observed: Civil War Dispatches of Noah Brooks, p. 83 (November 7, 1863). Douglas L. Wilson and Rodney O. Davis, Herndon’s Informants: Letters, Interviews, and Statements about Abraham Lincoln, p. 619 (Letter from Henry C. Whitney to William H. Herndon, June 23, 1887). Charles M. Hubbard, Lincoln Reshapes the Presidency, p. 53 (John R. Sellers, “Serving President Lincoln: The Public Career of John G. Nicolay”). Charles M. Hubbard, Lincoln Reshapes the Presidency, p. 55 (Letter from John G. Nicolay to Therena Bates, March 17, 1861). David Herbert Donald, “We Are Lincoln Men,” Abraham Lincoln and His Friends, p. 194. David Herbert Donald, “We Are Lincoln Men,” Abraham Lincoln and His Friends, p. 187. Charles M. Hubbard, Lincoln Reshapes the Presidency John R. Sellers, “Serving President Lincoln: The Public Career of John G. Nicolay”), p. 60. Wayne C. Temple, and Justin G. Turner, “Lincoln’s Castine:” Noah Brooks, Chapter VII, Lincoln Herald, Fall 1971, p. 169 (Letter from Charles H. Philbrick to Ozias M. Hatch, December 30, 1864). Charles M. Hubbard, Lincoln Reshapes the Presidency, p. 56 (John R. Sellers, “Serving President Lincoln: The Public Career of John G. Nicolay”). Michael Burlingame, At Lincoln’s Side: John Hay’s Civil War Correspondence and Selected Writings, p. 67. David Herbert Donald, “We Are Lincoln Men,” Abraham Lincoln and His Friends, pp. 183. Michael Burlingame, At Lincoln’s Side: John Hay’s Civil War Correspondence and Selected Writings, pp. 110 (Letter from John Hay to William H. Herndon, September 5, 1866). Charles M. Hubbard, Lincoln Reshapes the Presidency, pp. 66-67 Michael Burlingame, “Lincoln Spins the Press”). Michael Burlingame, Dispatches from Lincoln’s White House: The Anonymous Civil War Journalism of Presidential Secretary William O. Stoddard, p. 79 (May 12, 1862). Michael Burlingame, Dispatches from Lincoln’s White House: The Anonymous Civil War Journalism of Presidential Secretary William O. Stoddard, p. xix. Michael Burlingame, Dispatches from Lincoln’s White House: The Anonymous Civil War Journalism of Presidential Secretary William O. Stoddard, p. 197 (December 14, 1863). William O. Stoddard, Inside the White House in War Times, p. 186. Charles M. Hubbard, Lincoln Reshapes the Presidency (Michael Burlingame, Lincoln Spins the Press), p. 76. Michael Burlingame, Dispatches from Lincoln’s White House: The Anonymous Civil War Journalism of Presidential Secretary William O. Stoddard, p. 88-89 (July 21, 1862)..
William O. Stoddard, Inside the White House in War Times, p. 244. Matthew Pinsker, Lincoln’s Sanctuary: Abraham Lincoln and the Soldier’s Home, 111. Michael Burlingame, At Lincoln’s Side: John Hay’s Civil War Correspondence and Selected Writings, p. 63 (Letter from John Hay to John G. Nicolay, September 11, 1863). Michael Burlingame Editor, Inside the White House in War Times: Memoirs and Report of Lincoln’s Secretary, p. xii. Michael Burlingame, At Lincoln’s Side: John Hay’s Civil War Correspondence and Selected Writings, p. 93 (Letter from John Hay to John G. Nicolay, August 26, 1864). Michael Burlingame, At Lincoln’s Side: John Hay’s Civil War Correspondence and Selected Writings, p. 91 (Letter from John Hay to John G. Nicolay, October 28, 1862). Michael Burlingame, At Lincoln’s Side: John Hay’s Civil War Correspondence and Selected Writings, 95 (Letter from John Hay to John G. Nicolay, September 24 1864). Michael Burlingame, At Lincoln’s Side: John Hay’s Civil War Correspondence and Selected Writings, p. 104 (Letter from John Hay to Charles H. Philbrick, April 6, 1865). Michael Burlingame, At Lincoln’s Side: John Hay’s Civil War Correspondence and Selected Writings, p. 49 (Letter from John Hay to John G. Nicolay, August 7 1863). Michael Burlingame, At Lincoln’s Side: John Hay’s Civil War Correspondence and Selected Writings, p. 91 (Letter from John Hay to Edward D. Neill, July 14, 1864)..
Michael Burlingame, Lincoln Observed: Civil War Dispatches of Noah Brooks, p. 83 (Conversation with E.D. Neill, May 18, 1874). Wayne C. Temple, and Justin G. Turner, “Lincoln’s Castine:” Noah Brooks, Chapter VII, Lincoln Herald, p. 168 (Washington National Intelligencer, March 14, 1865). Michael Burlingame, Lincoln Observed: Civil War Dispatches of Noah Brooks, p. 82 (November 7, 1863). Ronald D. Rietveld, “The Lincoln White House Community”, Journal of the Abraham Lincoln Association, p. 68 (Letter from Charles H. Philbrick to O.M. Hatch, December 30, 1864). Herbert Mitgang, The Fiery Trial: A Life of Abraham Lincoln, p. 163. Michael Burlingame, Lincoln Observed: Civil War Dispatches of Noah Brooks, p. 5. Wayne C. Temple and Justin G. Turner, Lincoln, Lincoln Herald, Fall 1971, pp. 165-166. Noah Brooks, Washington, D.C. in Lincoln’s Time: A Memoir of the Civil War Era by the Newspaperman Who Knew Lincoln Best, p. 148. Wayne C. Temple, and Justin G. Turner, “Lincoln’s Castine:’ Noah Brooks, Chapter VII, Lincoln Herald, Fall 1971, p. 164 (Letter from Noah Brooks to Rev. Isaac P. Langworthy, May 10, 1865). Michael Burlingame, Lincoln Observed: Civil War Dispatches of Noah Brooks, 188. Michael Burlingame, Lincoln Observed: Civil War Dispatches of Noah Brooks, pp. 193-194 (April 16, 1865).